Columbus is the hop of the month for May in our Spice of Life series, the single-hop solo performance with the same beer recipe that changes each month. One of the three C’s of American hops (along with Cascade and Centennial), Columbus is a citrusy, resiny, and piney-tasting hop that tastes great with spring fare or just alone. Next month, we’ll be introducing our final hop in this year’s Spice of Life rotation: Crystal. But the series won’t just end there. We’ve enjoyed tasting our way through twelve different hops so much in this beer series, we’ll be announcing a whole new calendar of hops for next year. Some hops will remain in the rotation, while new ones will be introduced to the series (and our palates). More hops, from more parts of the world = more spices of life. Some to look out for in the upcoming months include hops that we’ve never brewed with in Red Hook before: Riwaka, Pacifica, Wakatu, Summer and Ahtanum. We’re also bringing some of our favorite hops to brew with like Glacier and Sorachi Ace into the mix. 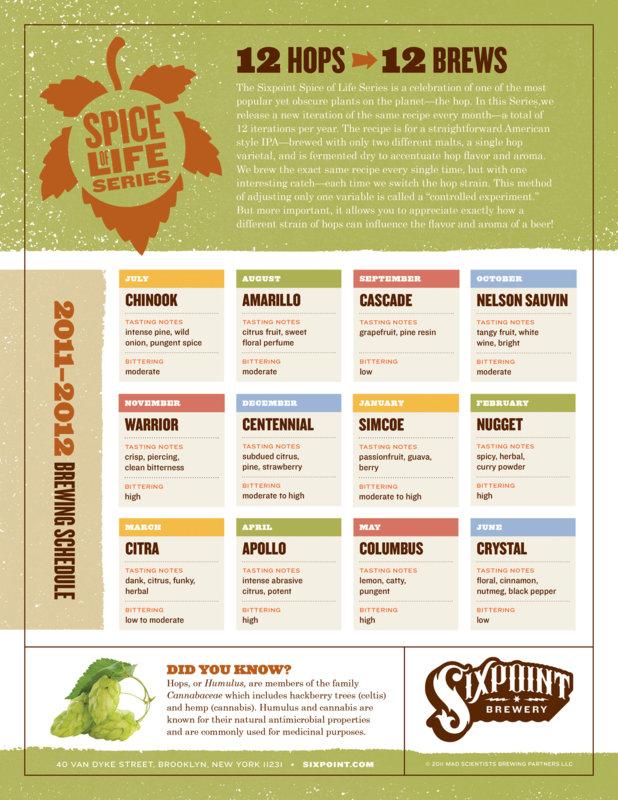 We’ll have a full chart of these hops and their unique characteristics as each Spice of Life beer with them makes their entry into bars. And for now, grab a pint of Columbus and let us know what you think!